A pedestal fan that operates quietly and keeps you cool all year round. 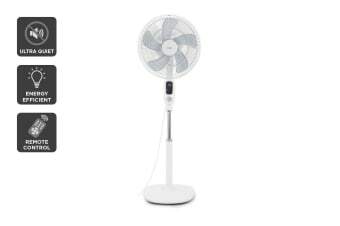 The Kogan Premium DC Motor Pedestal Fan gives you the best of both worlds with modern features and functions and the easy portability of a traditional pedestal fan. With 26 speeds and 4 modes to choose from, this fan has a setting perfect for rapid cooling on swelteringly hot days or providing a gentle breeze on mild summer evenings! The energy saving Sleep Mode allows you to leave the fan on at night and drift off to sleep. Just use its programmable timer to automatically turn off the fan at a given time during the night so that you don’t waste energy or get uncomfortable as temperature dips in the night. The Kogan Premium DC Motor Pedestal Fan works at only 27dB – that’s more than 50% quieter than regular fans. What this means for you is that you can drift off to sleep faster and stay asleep too without any of the disturbing noises of regular fans. The DC Motor in this fan is far more energy efficient than AC fans using only one-third of the power that they use! So, with the Kogan Premium DC Motor Pedestal Fan, you know that you’re using a more environmentally-friendly and pocket-friendly machine! 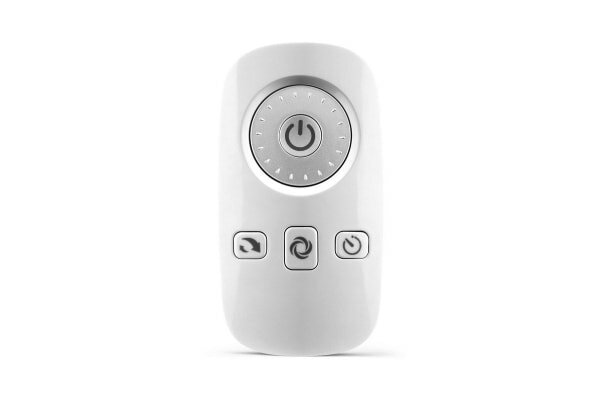 This fan comes with a handy dial remote that allows you to conveniently adjust speeds and modes from the comfort of your bed or couch. This fan has the slow speeds (better than AC) required for good control of air flow. Looks great and works beautifully. I love it and would buy again in a heartbeat. I especially enjoy the convience of the remote control and if you hold the power button on the fan itself, you can switch off the digital light display for a undisturbed nights sleep: this instruction is in the instruction booklet. Very happy with the quality of the fan. quiet. And surprisingly the LED light isnt as bright as I expected. appears to be a good product !